Meal time in my home can be a bit of a whirlwind. I am not the greatest cook although I am making attempts to learn more now that I have my son to feed. We do our best to make sure we at least all eat dinner together. Since my son is only 20 months old I tend to make him a "baby" version of what ever I will be having. One of my favorite things to eat is chilly cheese fries. Lately they have been a bit same old same old as far as flavors. I have tried different toppings to make them tastier but never did I think to try a different type of fries! I have noticed in the stores over the summer the emergence of Sweet Potato fries. I have been very curious to try them but my reluctant husband has said we probably would not like them. Wow was he wrong, and he will admit to it too! I was surprised at how delicious they are. My son gobbled up the Ore-Ida Sweet Potato Fries faster than our regular Ore-Ida Extra Crispy fries. But this is the ending to our fun story about #OreIdaFries. 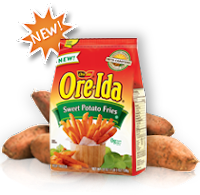 To find Ore-Ida Sweet Potato Fries we searched for them at a few Sam's Clubs. We have been Sam's members for at least 10 years now. I love going there to get great deals on products we use daily and to find new products. I once tried a fudge on sample day that was so good! This day I was on a mission to find the Ore-Ida Sweet Potato Fries by Heinz to swap out my regular fries. When we first got into the store my son immediately noticed the Big Screen tvs playing one of his favorite movies Rio. We stood there for a few minutes dancing to the songs then continued shopping. We went past the snacks section full of tempting treats, but I was sticking to my plan of trying to make it a healthy shopping trip. We headed to the Frozen Foods section to find our Ore-Ida Sweet Potato Fries by Heniz. They were super easy to find under the "Potatoes" label. We found them right next to the Ore-Ida fries we usually purchase. We grabbed a bag to put in our cart and continued to shop around. We went the juice section to see of they carried a brand my son loves, no luck there. We spotted my once favorite Naked Juice but opted to wait to get Fruit Simple instead. We had to visit my favorite section where they place the holiday stuff. We found great Halloween items there. Its a fun reminder that the fall is just around the corner! We then headed to the Back to School supplies for any great deals that were a must have. Then I remembered I needed to find beans for my chili cheese fries. I first looked for the brand I like to buy, S and W then for the type of bean I was trying to find, black beans. I did not find black beans but I knew I could get them on the way home at Walmart. Since we were just at Sam's getting household supplies and food a few days before this all we needed for this trip was our #OreIdaFries . As we headed out I resisted the temptation to get a pretzel and an icee since I did not want to spoil our appetites. The check out lady was super sweet and drew a smiley face on our receipt. The door attendant was also a nice woman who commented on how beautiful my son's eyes are and gave him another smiley face on our receipt. Great way to leave a store, flattered and with exactly what we came for in our cart! As soon as we got home I pre-heated the oven and got all our ingredients to do my spin on Chilly Cheese Fries using Ore-Ida Sweet Potato Fries by Heniz. I used black beans with tons of freshly ground pepper for the chilly part. I know its not regular chilly but it something my son and I love to eat. I buy the 50% less sodium cans when my son is going to be eating them too. After the #OreIdaFries were done I left them sit for a bit while I made the beans. I always drain out all of the water from the can and even put in a bit of water and swish it around to get out all the starchy water that is in with the beans. I find it to taste better when you do that. I put the beans in the saute pan with a bunch of pepper and warmed them up. For my sons part of the dish I smash up his beans and mix the cheese into the bean mash. He will eat every bit of the healthy black beans if I do it this way. Its not the prettiest way but he loves it. For me I left my beans whole. After the beans were hot I poured them over the Ore-Ida Sweet Potato Fries that I had sitting in the pan. I left them in the pan to make it easier to warm everything up. Then I added shredded cheddar and I added red onions to my side of the meal. I placed it in the oven at 350 degrees for 10-15 minutes to melt the cheese and warm the onions. I loved how it tasted! It gave my regular chilly cheese fries a whole new flavor. I will definitely be buying this again. Since we had our Sweet Potato #OreIdaFries I have had them with fish and green beans. We had family come over for the evening and with kids and adults both here I served a big plate of the Sweet Potato Fries with ketchup and ranch as dipping sauce. They were a huge hit and no one knew they were getting their beta carotene! *This project has been compensated as part of a #OreIdaFries shopping mission for Heinz with #CollectiveBias. All opinions are my own and may vary from others. Sweet potato fries = yummy yummy! Looks like your family enjoyed too! I love sweet potato fries!!! Great post. yummy! I actually made chili cheese fries with sweet potato fries this week too!! :-) I thought it was the perfect way to eat sweet potato fries!